After years of pining, I got myself an e-reader, or as it should be known: instant literary gratification machine. One of the benefits of the e-reader is that you can download writing that you didn’t know existed, at the exact moment you want to read it. In the interest of the column, I recently went on a tear reading about beer and bars. If you haven’t read Christine Sismondo’s excellent history, “America Walks into a Bar” (Oxford University Press, 2011), do yourself the favor. To download it from the Kindle Store it cost me $9.99, and all prices here reflect Kindle. She takes you from colonial times through Prohibition and civil rights struggles, all through the perspective of how taverns played their roles. Sismondo writes with passion about the importance of brewing. “Establishing taverns and micro-breweries, then, was a vital tradition by the time it reached the shores of New England in the early seventeenth century…” Some things never change. I asked Sismondo, a literature teacher and columnist, about the books she’s enjoyed that feature beer. She mentioned that Kurt Vonnegut as a writer who captured her interest early on, and in particular his satiric 1965 novel “God Bless You, Mr. Rosewater” (Rosetta Books, 2011; $11.99). Along with “one of literature’s all-time greatest bar scenes” in James Joyce’s magnum opus, “Ulysses,” (Public Domain Books; free) Sismondo also admires the writing of Ernest Hemingway (who most likely was part of some great bar scenes himself). In particular, the short story “Hills Like White Elephants” from his collection, “Men Without Women” (Scribner, 2002; $9.73), is worthy of mention. Hemingway is at his most deceptively simple in this story as he covers up plot’s real issue of abortion, Sismondo said. “The crisis abates at pretty much the same moment the characters are served a glass of beer,” she said. While “The Tender Bar” (Hyperion, 2006; $8.13) by Pulitzer prize-winning author J.R. Moehringer is the more popular tale of growing up in and around a drinking establishment, I found another love story to a more famous watering hole. “Over P.J. Clarke’s Bar” (Skyhorse Publishing, 2012; $9.39) is all about the scandalous history of the New York City hot spot beloved by Frank Sinatra, Marilyn Monroe and Nat King Cole among many others famous clientele. Author Helen Marie Clarke weaves a tale that’s parts journalistic and personal (her granduncle bought the saloon in 1912) to give you a sense of what gives a bar its charm and magnetism. Need a little beer education? There’s “The World Atlas of Beer” (Mitchell Beazley, 2012; $9.99) by Tim Webb and Stephen Beaumont. With stunning photography, a comprehensive overview of history and beer style, the book takes you on a virtual journey that makes you want to cash in your frequent flyer miles. E-readers give you a chance to find books from obscure authors and tiny publishers, often on the cheap. One I stumbled upon was Liz Crowe’s romance thriller “Paradise Hops” (Tri Destiny Publishing, 2012; $4.99). Searching “beer” led me to Tom Burnett’s “Beer in the Balkans” (CreateSpace Independent Publishing Platform, 2012; $1.79), a travelogue of sorts about a Brit in search of the perfect pint while traveling through Hungary, Kosovo, and about a dozen other countries. Honesty: we look for it on the page as much as we do in the glass. Backstage Restaurant (84 Main St., Torrington) is planning to expand its number of taps from 24 to 40 in by about mid-February, says General Manager Chris Verrilli. Beer Snob currently has no book, but his writing can be found on the interwebs: @BeerSnobCT on Twitter and also on Facebook. RELATED POST: Celebrate Good Times, C’mon! This entry was posted in Beer Snob and tagged Backstage, Christine Sismondo, literature. Bookmark the permalink. 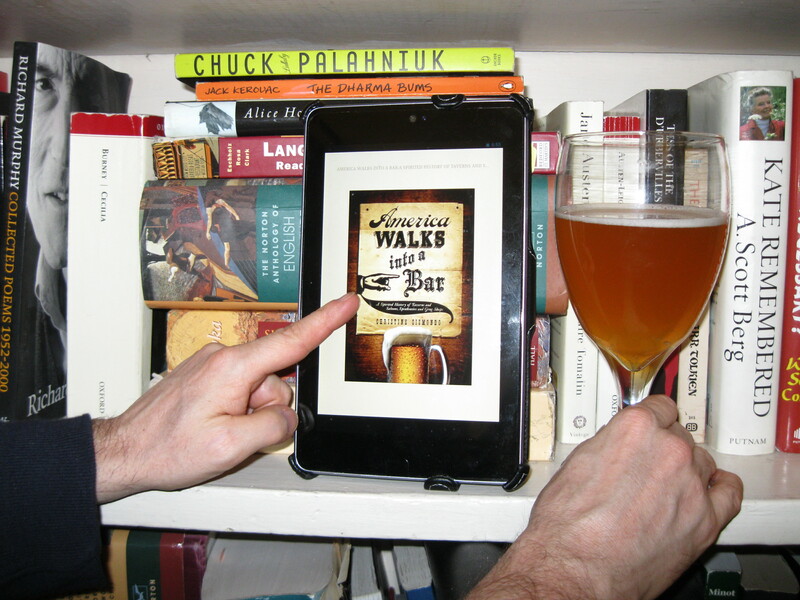 Now what you didn’t go into is taking your e-reader to the bar and reading there while you’re sampling. Or am I the only one who does that? 🙂 Nice list of suggestions! Also happy to see that Backstage will be increasing their offerings!